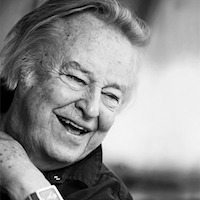 Born in Helsinki, Finland in 1932. Eero is considered to be one of the greatest innovators of modern furniture design of his generation. After graduating from the Institute of Industrial Arts in his hometown of Helsinki, Eero Aarnio began experimenting with plastics, using vivid colours and organic forms, often inspired by nature. The Finn’s chair designs created a unique furniture experience, breaking away from traditional design, echoing essential aspects of the 1960’s pop culture and spirit of that era. Aarnio managed to capture the psychedelic Pop Art movement of the 1960's and blend it with a cutting edge yet signature style.